Scientists have created genetically modified cattle that produce "human" milk in a bid to make cows' milk more nutritious. The scientists have successfully introduced human genes into 300 dairy cows to produce milk with the same properties as human breast milk. Human milk contains high quantities of key nutrients that can help to boost the immune system of babies and reduce the risk of infections. “We aim to commercialize some research in this area in coming three years. For the “human-like milk”, 10 years or maybe more time will be required to finally pour this enhanced milk into the consumer’s cup.” China is now leading the way in research on genetically modified food and the rules on the technology are more relaxed than those in place in Europe. 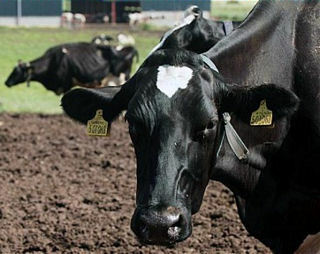 The researchers used cloning technology to introduce human genes into the DNA of Holstein dairy cows before the genetically modified embryos were implanted into surrogate cows. Writing in the scientific peer-reviewed journal Public Library of Science One, the researchers said they were able to create cows that produced milk containing a human protein called lysozyme, Lysozyme is an antimicrobial protein naturally found in large quantities in human breast milk. It helps to protect infants from bacterial infections during their early days of life. Professor Li and his colleagues, who have been working with the Beijing GenProtein Biotechnology Company, said their work has shown it was possible to "humanise" cows milk. In all, the scientists said they have produced a herd of around 300 cows that are able to produce human-like milk. The transgenic animals are physically identical to ordinary cows. Writing in the journal, Professor Li said: "Our study describes transgenic cattle whose milk offers the similar nutritional benefits as human milk. "The modified bovine milk is a possible substitute for human milk. It fulfilled the conception of humanising the bovine milk." Speaking to The Sunday Telegraph, he added the “human-like milk” would provide “much higher nutritional content”. He said they had managed to produce three generations of GM cows but for commercial production there would need to be large numbers of cows produced. He said: “Human milk contains the ‘just right’ proportions of protein, carbohydrates, fats, minerals, and vitamins for an infant’s optimal growth and development. “As our daily food, the cow’s milk provided us the basic source of nutrition. But the digestion and absorption problems made it not the perfect food for human being." The researchers also insist having antimicrobial proteins in the cows milk can also be good for the animals by helping to reduce infections of their udders. Scientists insist genetically modified foods are unlikely to pose a threat to food safety and in the United States consumers have been eating genetically modified foods for decades. However, during two experiments by the Chinese researchers, which resulted in 42 transgenic calves being born, just 26 of the animals survived after ten died shortly after birth, most with gastrointestinal disease, and a further six died within six months of birth. Researchers accept that the cloning technology used in genetic modification can affect the development and survival of cloned animals, although the reason why is not well understood. A spokesman for the Royal Society for the Protection of Animals said the organisation was "extremely concerned" about how the GM cows had been produced. She said: "Offspring of cloned animals often suffer health and welfare problems, so this would be a grave concern. "Why do we need this milk – what is it giving us that we haven't already got." Helen Wallace, director of biotechnology monitoring group GeneWatch UK, said: "We have major concerns about this research to genetically modify cows with human genes. "There are major welfare issues with genetically modified animals as you get high numbers of still births. "There is a question about whether milk from these cows is going to be safe from humans and it is really hard to tell that unless you do large clinical trials like you would a drug, so there will be uncertainty about whether it could be harmful to some people. "Ethically there are issues about mass producing animals in this way." Professor Keith Campbell, a biologist at the University of Nottingham works with transgenic animals, said: "Genetically modified animals and plants are not going to be harmful unless you deliberately put in a gene that is going to be poisonous. Why would anyone do that in a food? "Genetically modified food, if done correctly, can provide huge benefit for consumers in terms of producing better products."